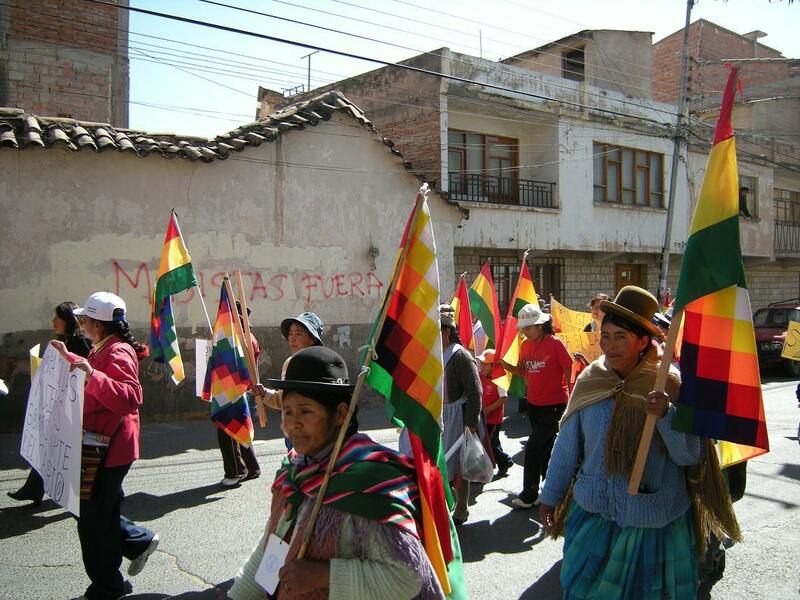 To take a step back, the rapid advance of a largely indigenous grassroots left in Bolivia has been met by a polarizing of the politics here. Region (the highland west/center vs. the lowland east “the Media Luna”), race (native vs. mestizo-white), and divisions that capture both (Kolla vs. Camba) have been key dividing lines that are suddenly more visible. This is in part a reaction to the biggest line crossing of all, the presence of an indigenous peasant union leader, Evo Morales, in the presidency, but it goes beyond that. In the east, particularly Santa Cruz, the white opposition has cottoned on to a long-running aspiration to autonomy for the department (think state in the US or province in Canada; provinces here are smaller divisions). This separatism has a youth wing, whose focus goes beyond separation to attacking and intimidating indigenous leaders and offices of the MAS party in national government. This wing, often with broader collaboration from the white opposition parties, have been threatening and carrying violence to disrupt what might otherwise be run-of-the-mill state functions involving Morales. This has reached the point where the President has been avoiding certain cities because regional governments are not guaranteeing his security. So, back to the video. On May 24 in Sucre, Evo was set to preside over the awarding of ambulances to each province across the department of Chuquisaca, whose capital is Sucre. Right-wing youth and the anti-Morales mayor’s Inter-insitutional Committee urged Evo not to come, and threatened a confrontation. With local leaders from the countryside already on their way in, Evo backed down from attending. The rightists turned on the indigenous leaders, attacking with sticks and rocks. Several dozen fled to a house on the outskirts of town, only to be surrounded there. They were escorted forcibly from there to Sucre’s main square, where a spectacle of public humiliation unfolded over the afternoon. Stripped to their underwear, forced to kneel, they had to endure insults, punches, and watch as their banners and the indigenous flag (or wiphala) was burned. The spectacle, captured by the mainstream media, continued for quite a long time. In the judgment of the documentarian, the withdrawal of national police on the day happened because of a strategic decision to face and reveal what the rightists would do, rather than to confront them with force. If so, the price involved was paid by the indigenous leaders, whose pained after-the-fact interviews formed a key part of the documentary. It was a hard film to watch, and left me in a pretty pensive mood Monday night. I had known that one in a series of racist outrages had happened in Sucre in May, and that the Women’s Summit would feature a public act dis-agression (desagravio) to repudiate it. But this was the first I had seen what was actually involved. The whole situation strongly evokes what I’ve heard of the (US) Southern response to the Civil Rights Movement. How on front lawns, in jails, and with gunshots, the ugliest parts of a history of racism were revived to terrorize people organizing for equality. As it happened, today’s desagravio was a complete success. Leaving from the ministadium where the summit is happening, a march of over 1,000 people traversed all over Sucre, including the plaza where local leaders were humiliated. 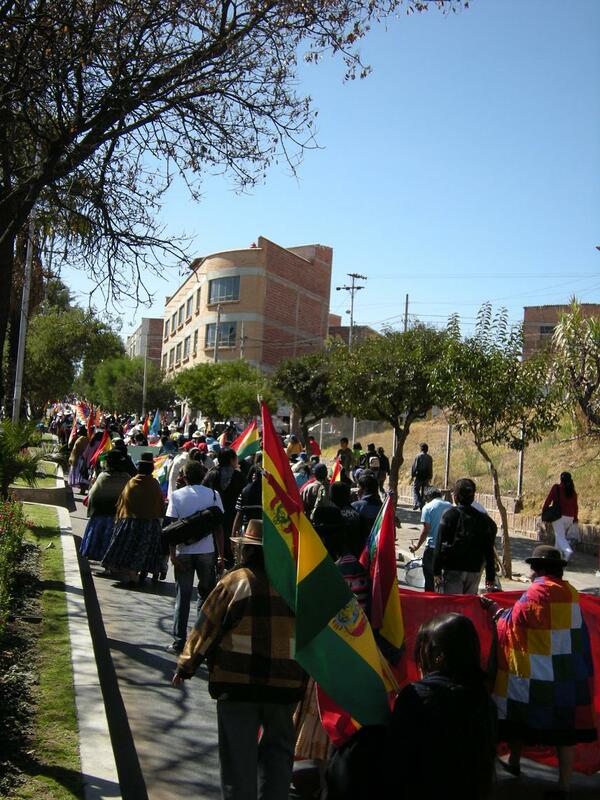 As women filed through Sucre’s streets, wiphala and Bolivian flags in hand, shouting slogans for unity and against racism, scores of people came out in the streets: a few hostile but calmed by our numbers, and many visibly relieved and excited to have the march there–applauding as the march went past. The act was a defiance of fear. For me, a little, and for the movement a great deal. It’s hoped that it can change the dynamic in the streets and in this department. The section I marched with had a frequent chant: “Viva la esperanza. Basta de racismo. [Long live hope. Enough of racism. ]” For now, I just want to convey that it happened, and happened in peace and providing some inspiration.